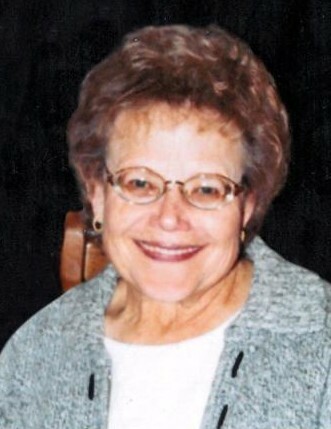 LaWana Glines Oman, age 85, of Altamont, Utah returned to her loving Heavenly Father and the arms of her family on April 4, 2019. She was born on November 10, 1933 in Tridell, Utah to Charles Henry Glines and Blanche LaZelle Kitchen. LaWana grew up in Tridell loving the beautiful Valley of the Red Hills on Kiss Me Flat Top. LaWana was the oldest of 6 children; LaWana, Charles Morgan, Alice, Leon Kay, George Eugene, and Dennis Voy. LaWana learned the value of hard work, becoming a great cook, seamstress, and gardener from her parents and grandparents. She graduated from Union High School in 1952 and was part of the first graduating class at the newly constructed school. In the fall, LaWana met her sweetheart Orlan Bernard Oman in Roosevelt being highly impressed with his yellow Dodge convertible. She “soon found out that he had more class and personality than his car” and married Orlan in the Salt Lake Temple on May 25, 1953. LaWana lived in Pacific Grove, Monterey, and Seaside, California. She worked as a typist, bookkeeper and secretary while her husband Orlan served in the army; she also served as a Stake Missionary during this time. In 1955 LaWana and her husband moved to Salt Lake City, Utah and soon found the perfect property and farm in Altonah, Utah where they eventually built their current home and raised their family. They were blessed with five boys; she loved being a mother and cherished every moment with her family. LaWana and her husband built and opened the Oman’s Dairy Freeze in 1974 on Main Street, Altamont, Utah where many neighbors and visitors enjoyed their great hamburgers, fries, ice cream and shakes, pool table, foosball and arcade games until 2005 when they retired. LaWana was an active member of the Church of Jesus Christ of Latter-day Saints where she held many callings including being in multiple Relief Society and mutual presidencies, a pianist, teacher, and librarian. She and her husband served in the South Africa, Cape Town mission in 1986-1987. She was also a temple ordinance worker in the Vernal Temple for 17 years. LaWana was blessed with many talents; she was very musically inclined playing the piano and accordion; she also loved to sing. She was known for her wonderful cooking skills especially when it came to her homemade pies, bread, cinnamon rolls, jams, and according to her family “anything she made.” She was a great teacher and passed on her cooking legacy to her posterity. LaWana was also an incredible seamstress who loved creating beautiful clothing and quilts. Her posterity and friends have been blessed and warmed by her quilts across the country. LaWana always grew an amazing garden and loved flowers. LaWana also loved going to the mountains for hot dog/wiener roasts with her family. Spending time in the mountains was always a joy for her, especially at family reunions. Sunday afternoon drives always found her in the mountains looking for deer and the changing of the aspen leaves. Cold spring drinks directly from the mountain always brought a smile to her face. She loved being in the outdoors. LaWana is survived by her husband Orlan Bernard Oman, their children Val (Kathy) Oman, Altamont, UT; David (Marcia) Oman, Bountiful, UT; Randy (Meri Lee) Oman, Altamont, UT; Rick (Lori) Oman, Altamont, UT; Delbert (Tephra) Oman, Burley, ID; 21 grandchildren, and 52 great-grandchildren. She was preceded in death by her parents Charles and LaZelle Glines, and brother Leon Glines. Funeral services will be held on April 10, 2019 at 11:00 a.m. at The Church of Jesus Christ of Latter-day Saints Chapel at 15600 W 4000 N on Main Street in Altamont. Viewings will be held on Tuesday evening at the church from 6 - 8 p.m. and Wednesday from 9:30 - 10:45 a.m.
Burial will be at the Altamont Cemetery.